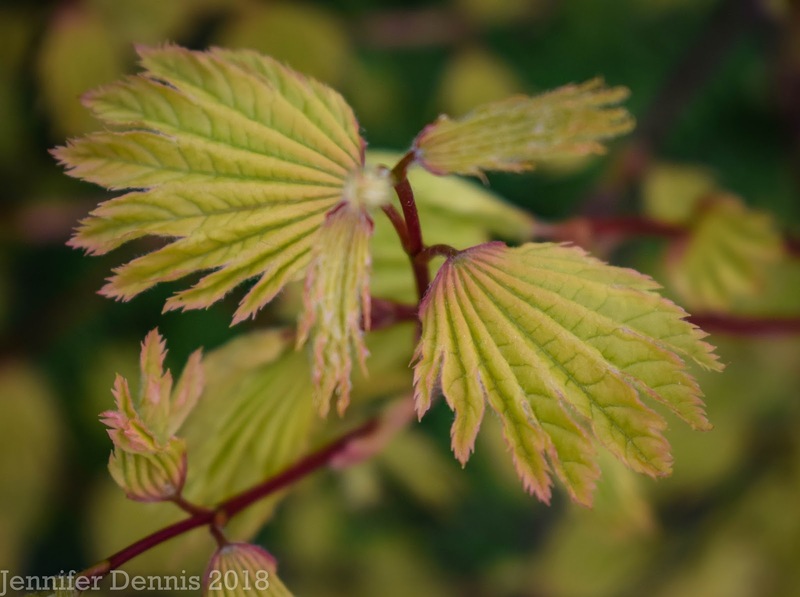 Onto colorful foliage in the spring garden as spring is not just about burgeoning blooms. 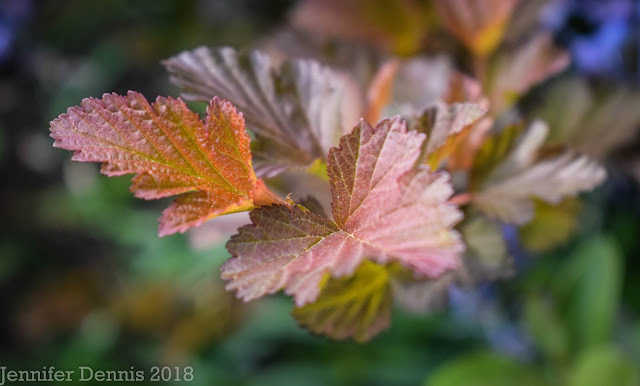 In my attempt to grow as a gardener and expand the points of interest in my garden, I've been keeping an eye out for plants with colorful foliage. 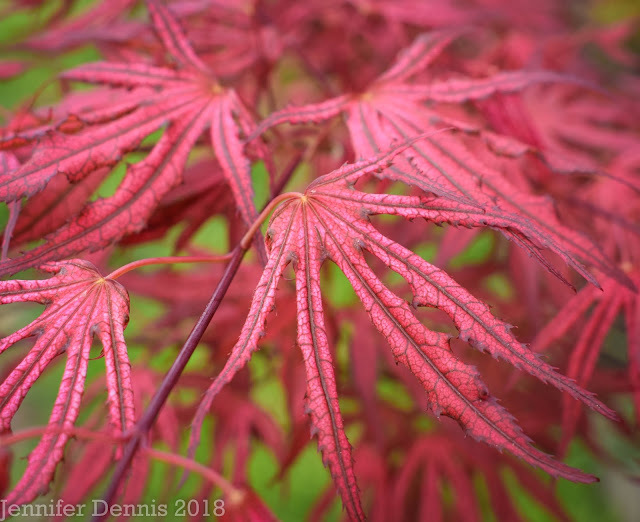 Japanese maples are a favorite as many varieties offer three seasons of color variations. 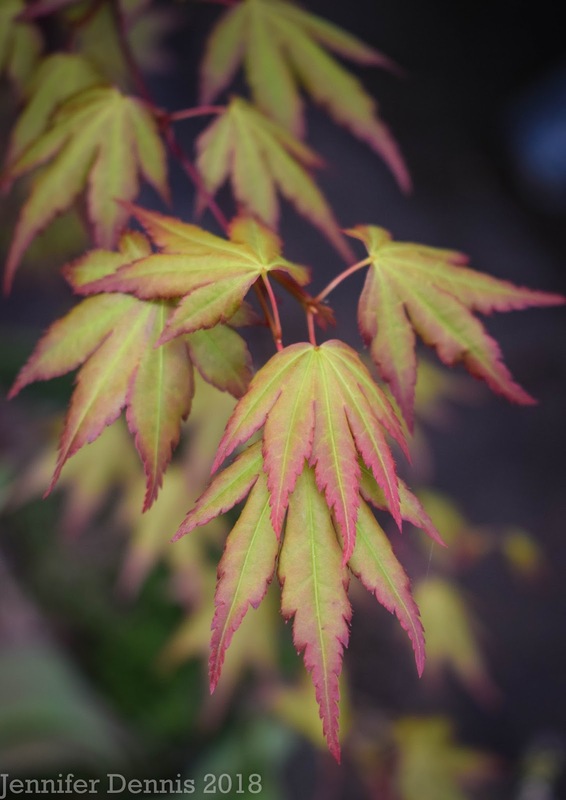 Above, a Japanese maple 'acer palmatium' that I picked up at one of our Oregon garden bloggers plant swaps from Alyse over at Garden Inspiration blog. The vignette above was quite the pretty scene earlier in April. I love rodgerisa. It's hard to find a truly deep bronze color in the spring garden and this plant hits the spot. Below is another Japanese maple that I have been nursing along. It came as a tiny little twig and big enough now to make a dramatic color impact. 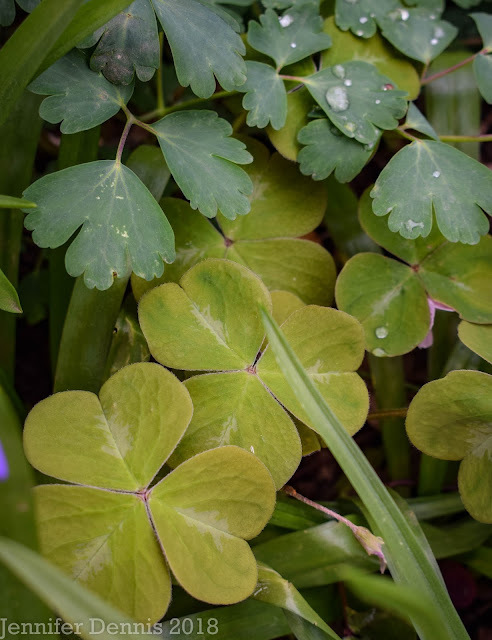 Below, in the shade garden, oxalis 'Klamath Ruby' looks bright in contrast to the cooler hue of the aquilega. The undersides of this oxalis are a soft, ruby red...a gorgeous ground cover plant. 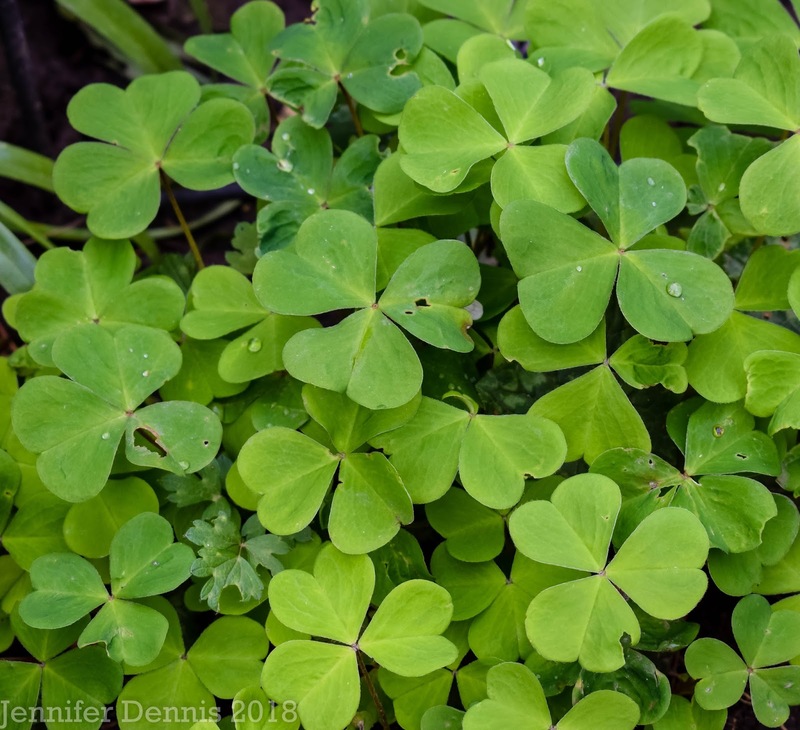 And here is the northern Oregon version, oxalis oregana. This perennial clumps nicely and spreads as well, but not voraciously. It creates a perfect spring green carpet. Below is a shrub that I fell in love with. I bought one (phycocarpus oplifolius) ninebark 'Center Glow' a few years ago. The new foliage is bronze on the outer edges with a center of chartreuse green. I have three now. The foliage turns a rich-burgundy hue by summer. They are vase shaped and can grow to 6-8 feet. It's become my go-to accent plant in foundation beds. 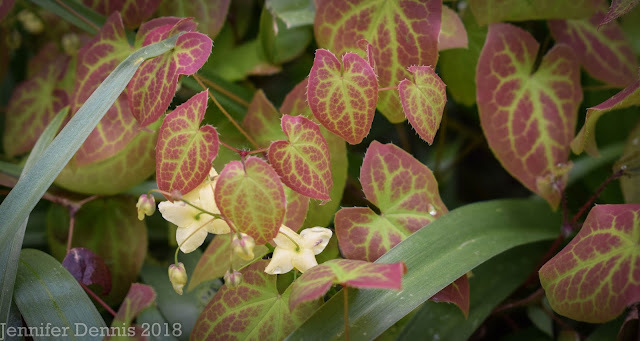 Hello pretty epimedium! The new foliage on 'Sulphureum' is a soft ruby red tone, with chartreuse centers. (Notice a pattern to what I like in the garden..?) It's a nice contrast to the otherwise 'green' ground covers in the shade garden that I currently grow. I'd be happy if it spread out a bit more. The simple, butter yellow, little blooms are icing on the cake. The brilliant thing about 'Sunglow' is that it is very slow growing. It may reach 6 feet in 10 years. It is native to our region, but you might be forgiven if you thought it was a hybrid due to that stand out color. I have placed it front and center by the steps to my front door. New foliage emerges chartreuse with a touch of apricot at the edge and look at those bright red stems! I'm getting closer to accomplishing my goal of a balanced approach to foliage/blossom color in spring. When those blooms fade, the foliage keeps my interest. 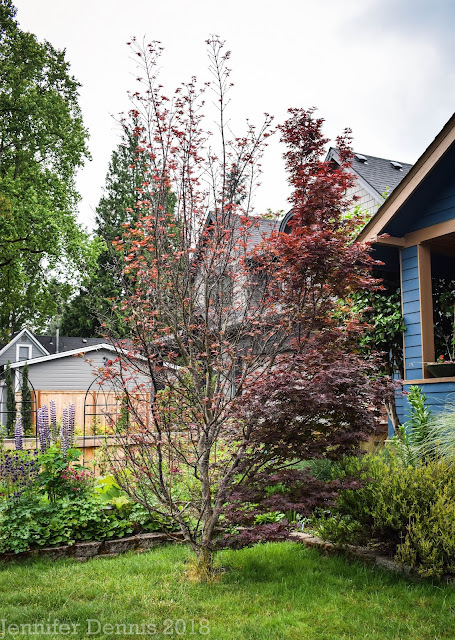 I love the foliage on dark-leaved ninebarks too, and they're relatively drought-tolerant as well. 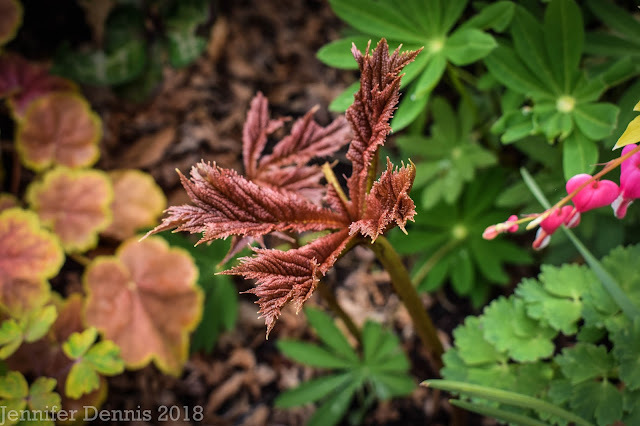 i have one of Alyse's Japanese maple 'acer palmatium' that I picked up at one of our Oregon garden bloggers plant swaps and it has that same beautiful new foliage, with three adorable little mushrooms growing in the compost i put around it recently. Having focused most of my life strictly on flowers, i am still learning all the foliage plants that really bring the garden alive. Lime green bright leaves, i count on them to light up the abundant shade i garden in. Still awaiting the sprouting forth of my rodgerisa. Surely the rodgerisa will pop up soon! When I took home Alyse's little tree last year, I had no idea how pretty that new spring foliage would be. What a treat!